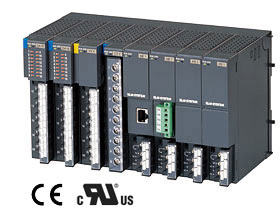 Wide selection of I/O modules and network modules. Great flexibilities in number and type of I/O signals: DC current/voltage, temperature, strain gauge, AC current/voltage, AC power, etc. Economical DC input module can handle fully-isolated 4 points up to non-isolated 16 points. M3 screw terminal block is used for I/O modules. The removable terminal block is convenient for maintenance. Network Module and Power Supply Module in one housing. One I/O module plus one Network Module with power supply is the minimum unit: Space-saving and economical solution. Dual network communication modules are optional for mission critical applications. The Power Supply Module is located at the right end, with Network Module inserted at its left. Network Module with incorporated power supply is available for small systems. Multiple I/O modules can be mounted; No.1 at the extreme left end, No.2 and following modules to its right.